The nationwide chain has had some very successful collaborations for its Artist Series, in which famous chefs, musicians and actors, like José Andrés, Mindy Kaling and The Black Keys, create their own limited-time burger for the national chain. Famous for his scientific breakdown of what makes umami so, well, umami, Alton Brown couldn’t be a more perfect pairing for the project. 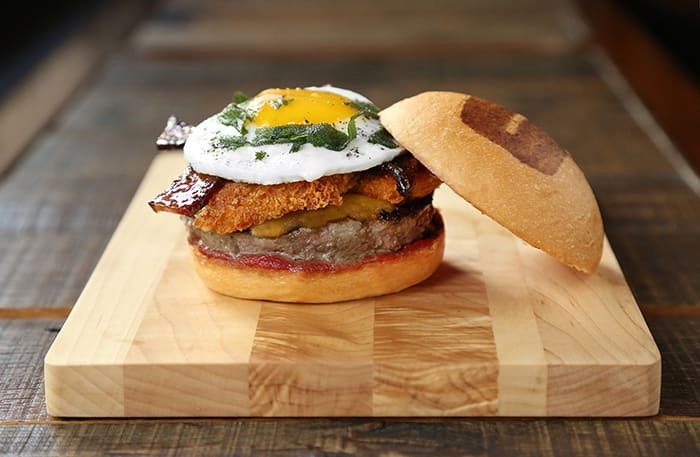 This spring he debuted this Southern-tinged ode to breakfast on a bun: a special patty made with Umami’s signature beef blend and bacon lardons, Brown’s own coffee-ketchup concoction, miso-maple bacon, cheddar cheese, smashed cheesy tots, a fried egg and fried sage. That’s a lot of fifth taste right there. Get it soon: It’s only available through April 14.